From Beyoncé to Taylor Swift to the Founders of Amazon and Google to NBA Player Stephen Curry, the Montessori approach has cultivated some of the world’s most successful business people, political leaders, and creative minds. Montessori is an educational approach, developed by Dr. Maria Montessori, Italy’s first female physician, in the late 1800’s. The approach develops independence, confidence, and grit, while satisfying a child’s inner curiosity and desire to learn. The Montessori classroom is equipped with specially-trained teachers that guide a child’s learning, with unique hands-on materials to facilitate deep learning at an early age. The Montessori approach can be applied from infancy to high school. Today, there are an estimated 20,000 Montessori schools worldwide. Unfortunately, the term “Montessori” has become a generic name and practically any childcare service can call itself a “Montessori School,” without any legal consequences or trademark infringements. It is entirely up to a parent to determine if a given school follows the Montessori Method and yield the results Montessori schools are known for. Parents should carefully weigh teacher credentials, the quality of Montessori materials, classroom management skills, experience of school leadership, and perspectives of current families. There are many myths about Montessori education – including the level of rigidity in the classroom and limited play as well as what constitutes authentic Montessori education – developed by pundits and non-experts in early education. On the contrary, the Montessori approach focuses on intellectual freedom, active socialization with peers and friends, and deep, fun learning with beautiful materials. There is a growing body of evidence that demonstrates the effectiveness of an authentic Montessori education compared to traditional preschool. In his July 2011 Harvard Business Review blog, Andrew McAfee of the Center for Digital Business in the MIT Sloan School of Management, discussed how the Montessori approach cultivates innovators for the 21st century. A 2017 longitudinal study confirmed a similar finding. The study, in Frontiers in Psychology, led by University of Virginia’s Angeline Stoll Lillard, compares students who participated in a randomized lottery-based admission to two public Montessori magnet schools in a high-poverty American city. The result? Montessori preschool elevated children’s learning outcomes and equalized outcomes among groups that may have unequal outcomes. Below is a comparison of a Montessori environment to a traditional early learning center. 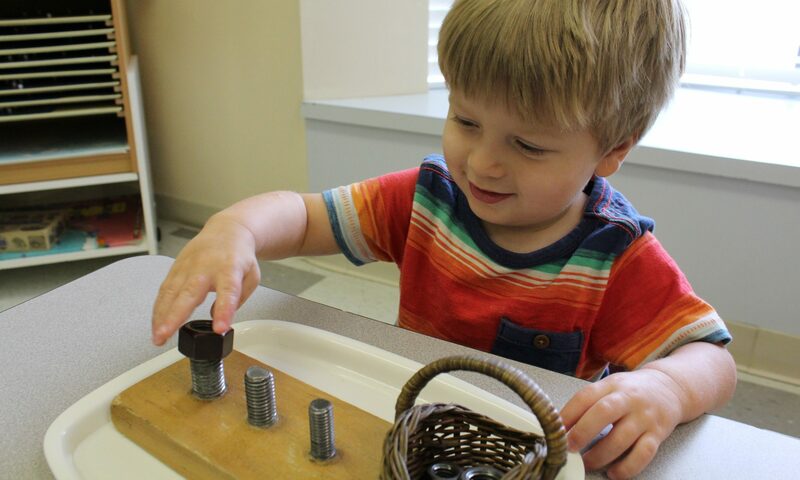 The Montessori approach – as research is starting to show – yields better learning outcomes. Our goal is a lifelong love of learning – not babysitting and forced academics. Instruction is given in groups, not accounting for student’s individual learning differences. Children may not be free to explore the classroom environment on their own and reveal their strengths. Loud classrooms are generally a sign of poor classroom management and unsafe practices. Overly-decorated classrooms are usually distracting and overly-stimulating, impeding a child’s ability to concentrate. Students are usually grouped into classrooms with students their own age, falsely linking development and academic ability with age. There are missed opportunities for learning how to interact with older and younger students. The teacher instructs a large group of students of the same age, from the front of a classroom. The teacher may not tailor instruction to individual needs given the pressure of handling a large number of students. Practical Life activities are designed to help children develop independence, fine motor skills and concentration. These activities are part of a child’s daily routine – and mimic adult work – like zipping a coat, setting the table, or sewing a button. Children learn to start and finish an activity to develop self-discipline and concentration, critical for future learning. Sensorial materials help children describe the world around them. Materials are used to refine the child’s senses and heighten their awareness to the subtleties of our world – while equipping them with the language to describe the world as they see it. In Montessori, reading is taught through phonics (the sounds of letters) versus the names of letters. Students typically begin reading at age 3 ½, take home reading books, and master parts of speech and grammar. Our goal is an expressive and imaginative child, grounded in a concrete understanding of the world. Our student’s regular routine in reading and writing is complemented by opportunities to practice oral communication through music, storytelling, and public speaking. Children are first taught to associate quantity with the numerals, preparing them for abstract reasoning and problem-solving. At their own pace, students learn to master telling time, money equivalency, fractions, addition, subtraction, multiplication and division. We guide children through the importance of scientific reasoning and how to communicate their thinking with logic, evidence, and experimentation. Students develop critical thinking skills while conducting their own experiments in class. Every month, our classroom conversations are driven by a unique science focus. In the 21st Century, children will interact with people from across the globe. Through cultural students, students explore physical geography, current events, and history through class discussions, guest speakers, and our International Doll of the Month speaker series.